I’ve written many mods for AX that required output of data to a text file of some form (the most common being CSV), but recently I had to ensure that the file being written was compliant with a UNIX reader. The default output for files created from within AX are UTF-16LE with the standard Windows CR+LF new-line characters. A UNIX system that expects ANSI formatting with just a single LF character as the new-line sequence will not be able to read these files due to additional characters prepended to the beginning of the file for the code page designator and the additional carriage return character at the end of each line. The TextIo object in AX provides us with the necessary settings to allow this specific type of output with very little additional coding. In the above example, using 0 as the code page parameter when creating the TextIo object specifies that the output file should use ANSI formatting (additional code page values can be found on this MSDN page). In order to use the UNIX style new-line, we call the outRecordDelimiter method with the numeric value of the UNIX line-feed character 10. This causes all “records” written to the file to be followed with a single line-feed character instead of the standard Windows carriage-return/line-feed sequence. There are many Blog entries around the web that go into much greater detail of how the File IO classes available in AX actually work, but I was unable to find any that specifically outlined a solution for writing UNIX styled text files from within AX so I decided to provide one of my own. If you know of any others feel free to provide links. With previous versions of AX utilizing the graphical interface for XPOs to deploy code, working with the Models & Models stores in AX 2012 using the command line tools may at times seem a bit tedious. With this in mind I began investigating the various functionality made available by the AxUtil.exe application as well as the PowerShell functions. Utilizing the same code libraries as the command line tools I was able to create a graphical interface that, at this point, contains most of the same basic functionality. 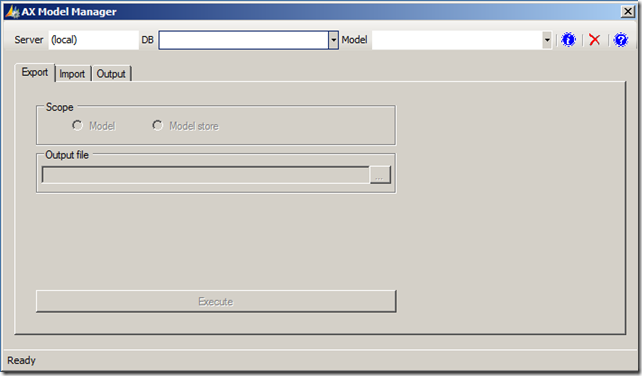 Select target AX Model Store database – model store databases are populated for the given server. 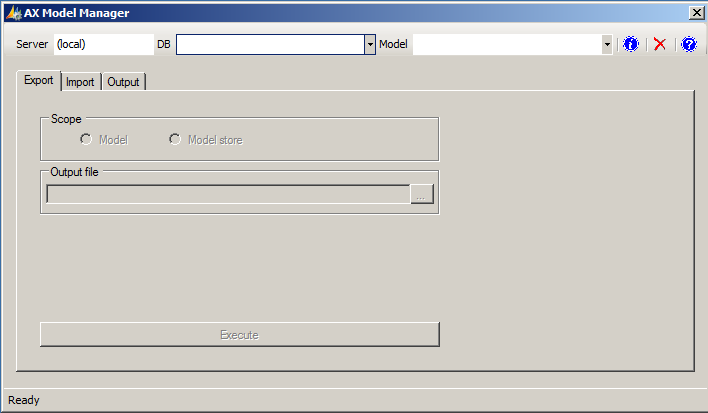 Select target Model – populated models in the selected store are available for selection in a drop down box. Model Manifest view – displays the properties of the currently selected model from the model store, or a model file opened for importing. The feedback that you normally see on the screen is redirected to the output tab with the most recent message displayed on the status bar. If there is any level of interest among the AX community, I will look into distribution options. If you’ve ever worked in a development environment that utilizes version control I’m sure that you have fell victim to the “missing objects” error during the build phase. This usually happens because sometimes you create objects in the AOT and forget to add them to version control. And at some point you check in other objects that contain references to those missing objects and the build server fails. In previous versions of AX I developed scripts to scan AOT objects and determine which ones had not been added to version control. These scripts could be very slow executing and usually ended up being used infrequently. Working in AX 2012 I have discovered a quick means of parsing new and modified AOT objects that utilizes the model stores and I applied it to my “Objects not in VCS” script. This new methodology is very quick at determining which items in the system have not been included in the version control system. By default the following job only scans the current layer and the active model (version control works by layer and model). The model restriction can be omitted to open up scanning of all objects in the layer, but it would defeat the purpose of the script if you were to remove the layer limitation. Recently while working with a custom control in EP for AX 2012 I came across an issue when trying to set focus to a specific Textbox. I implemented all of the standard focus functions available in code, but none of them would retain focus when the control was running in the AX EP environment. I also tried a multitude of suggested fixes found on various Blogs with no luck. So I started my on investigation and the following is my findings. I noticed that the target control would temporarily receive focus and then immediately lose it to a hidden system menu that exists at the top of the page. I dug deeper into this behavior and it led me to the DynamicsRestoreFocus java script that is available in the static file EPRestoreFocus. This script contains methods that are used to call focus to the various parts of an EP page. This method will calculate the date of the last specified weekday in the month of the given date. Some time ago a colleague presented me the task of computing a SHA256 hash for an output file. This hash would be stored in a table in a hexadecimal string format, along with the file info, to ensure that the file wasn’t modified by any external sources. To complete this task I generated the following code that uses CLRInterop to access the .Net System.Security.Cryptography namespace to compute the hash. The returned Byte Array is then converted into an X++ List object by utilizing an example I presented in another post named CLR Array to AX List. This List is then converted into a hexadecimal string.